In its broadest sense, this lavishly illustrated book is about the relationship between topography and the language of visual symbols a painter manipulates, or must invent, to suggest specific places. What meanings are encoded in topographical paintings? What do such pictures tell us about artist, audience, and society? What do these paintings reveal about deeply felt cultural attitudes about place? The middle decades of the eighteenth century in Japan were a time of enormous creative energy and burgeoning intellectual curiosity. A growing stress on the personality of the artist gave rise to a change in the status of the painter, who came to be seen as someone whose experiences were worthy of appreciation. Ike Taiga (1723-76), by virtue of his talent, forceful personality, and sensitivity to his patrons' tastes, captures the energy and aspirations of his age. Taiga gained artistic fame for his new methods of depicting actual places and ways of imbuing his paintings with meaning. From Chinese art he borrowed new modes of brushwork, conceptions of the moral authority inherent in the empirical observation of nature, and an appreciation of the painter as more than a craftsman. From the Japanese tradition, he tapped the sense of place, long a part of Japanese poetics. 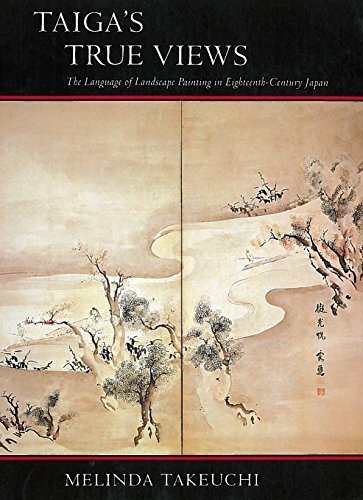 The author shows how Taiga's paintings relate to historical issues of his day and how they create a model of the artistic life that influenced the development of the literati painting movement in Japan. Just as Taiga represents a transitional moment in the Japanese concept of the artist, so his topographical paintings represent a transitional moment between the prescriptive, sketchbook models of the ancient tradition and the modern conception of plein air painting. The book is illustrated with 64 black-and-white half-tones and line drawings and 33 halftones in full color. It includes a catalogue raisonne of all Taiga's true view pictures, a chronology of his life, and a list of names he used. An appendix reproduces and discusses 37 of Taiga's seals. If you have any questions about this product by Brand: Stanford Univ Pr, contact us by completing and submitting the form below. If you are looking for a specif part number, please include it with your message.